December 12, 2017 – AZUR SPACE Solar Power GmbH, a leading provider of high-efficiency solar cells, assemblies and panels for both space and terrestrial power applications, announced today that it was chosen from a competitive procurement to provide solar panels for Sierra Nevada Corporation’s (SNC) first Dream Chaser spacecraft. AZUR SPACE has been supplying the space community for over 50 years and specifically with high-efficiency, multi-junction solar cells for the last 15 years. 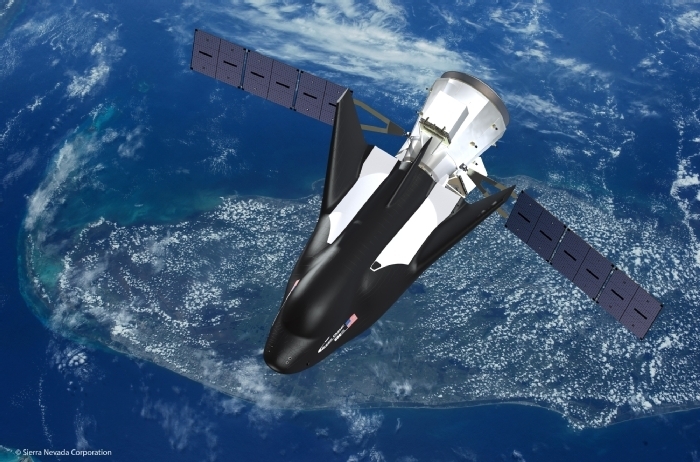 SNC recently completed a successful atmospheric Free-Flight test of its Dream Chaser spacecraft. The first orbital vehicle is scheduled to go to the International Space Station as early as 2020 for at least six missions as part of NASA’s Commercial Resupply Services 2 contract (CRS2). The missions will supply astronauts with much needed supplies and technical support elements and enable the gentle return of scientific experiments. The test vehicle was originally developed under the Commercial Crew Integrated Capabilities agreement (CCiCap). SNC’s Space Systems business area is based in Louisville, Colorado. ← Does New Horizons’ Next Target Have A Moon?